The analog signal from the player passes through the shortest signal route, first digitized at 24bit/96kHz through a pro A/D converter where it reaches the digital mixing stage with the best sound possible. The mixing is carried out by 32bit DSP with minimal deterioration of sound quality. A highly rigid chassis minimizes unnecessary vibration, which could adversely affect sound quality. 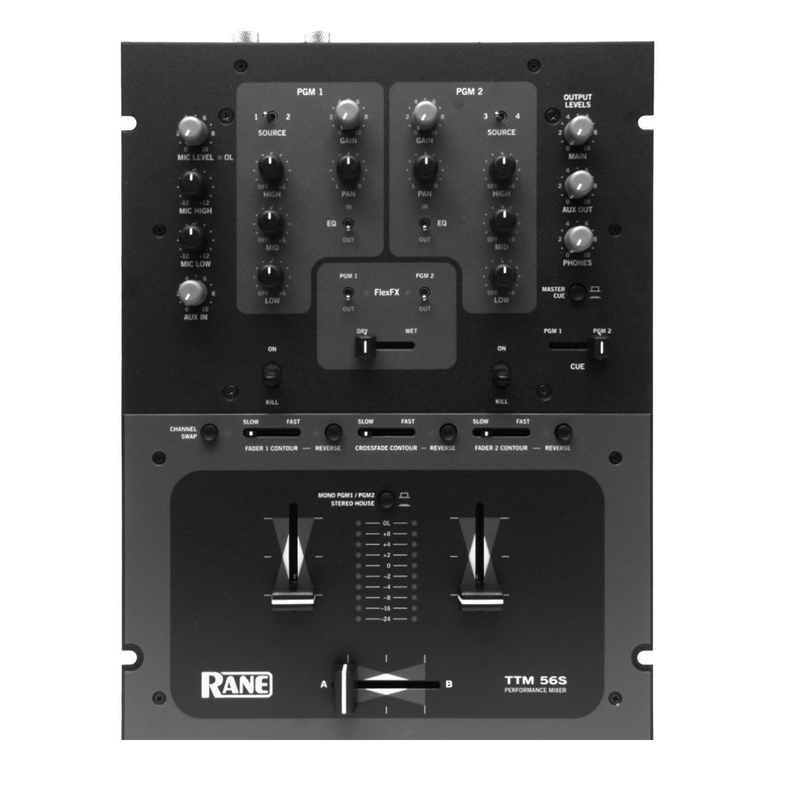 The Pioneer DJM800 DJ Mixer also incorporates a dual-shield structure for eliminating entry of digital noise and a high performance power supply for noise-free power. 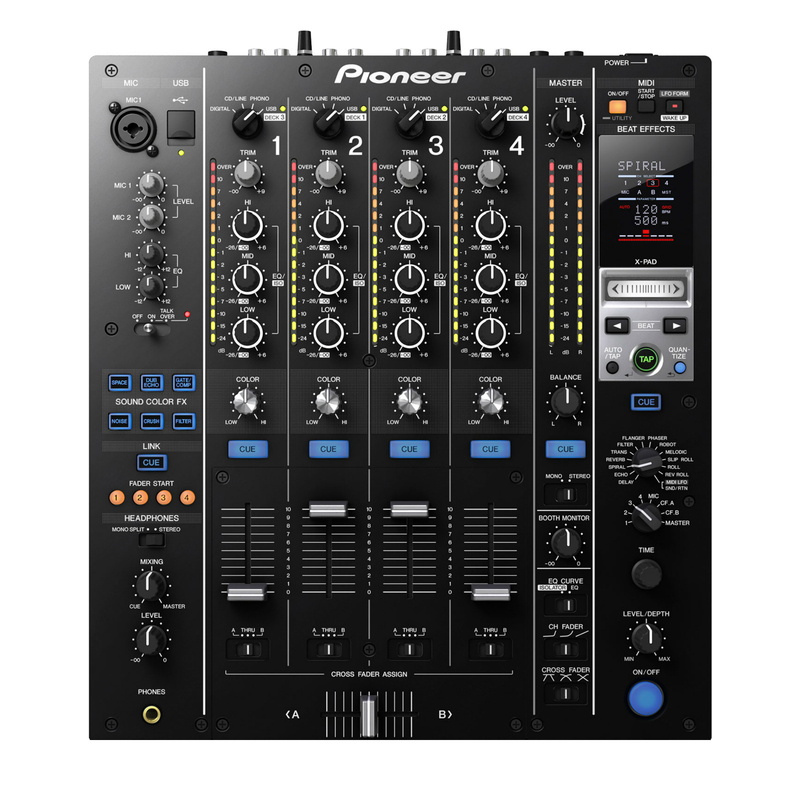 The Pioneer DJM800 is the world’s first DJ mixer with Auto Harmonic Tuning detects the key of song and automatically corrects to the closest true key. In music theory terms, when a DJ raises the pitch of a song in the key of C by three percent, the song is no longer in the key of C, but somewhere between C and C sharp. This makes it impossible to perform a perfect harmonic mix. Pioneer’s Harmonic Tuning feature takes the key of the source audio and adjusts the pitch until it is that of a standard note. Of course still has to know some basics about music, such as which keys match, in order to pull off an acoustically perfect harmonic mix. World class DJs currently spend thousands of hours learning the keys of their music and re-mastering their library to be in perfect pitch. 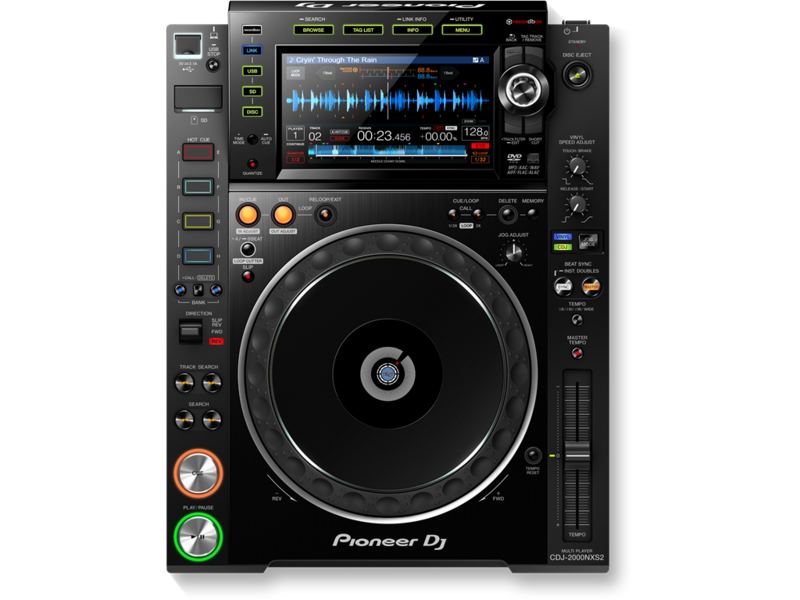 Now the Pioneer DJM800 makes it easier to perform a Harmonic Mix. 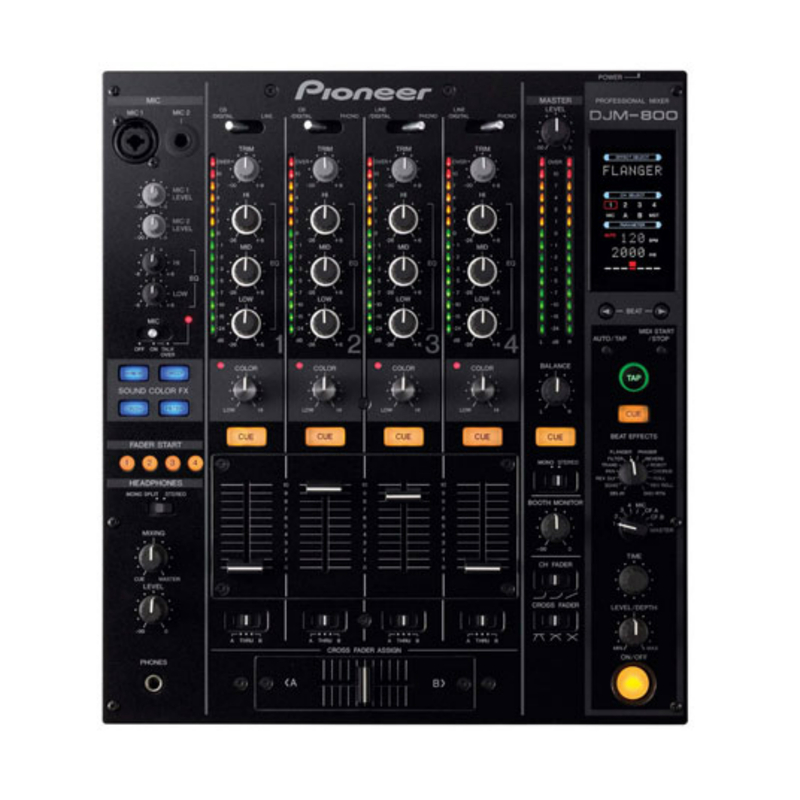 The Pioneer DJM800 Dj Mixer also incorporates a highpass / lowpass filter, notch filter and bit crusher effect for all channels. In conjunction with the additional Beat Effects, 50 combinations of effects are possible. Higher quality effects at 24bits make for a cleaner sounding remix. The effects automatically detect the BPM of the music and sync to the beats. The DJM800 DJ Mixer includes some familiar effects, plus some new ones: Echo, Delay, Reverse Delay, Pan, Transform, Filter, Flanger, Phaser, Reverb, Robot, Chorus, Roll and Reverse Roll. The Pioneer DJM800 is not only ideal for the club professional but also great in a recording studio environment where high fidelity sound is required. Input frequencies of 44.1/48/96kHz are compatible; output frequency is selectable between 48/96kHz. There are a total of 61 assignable controls. 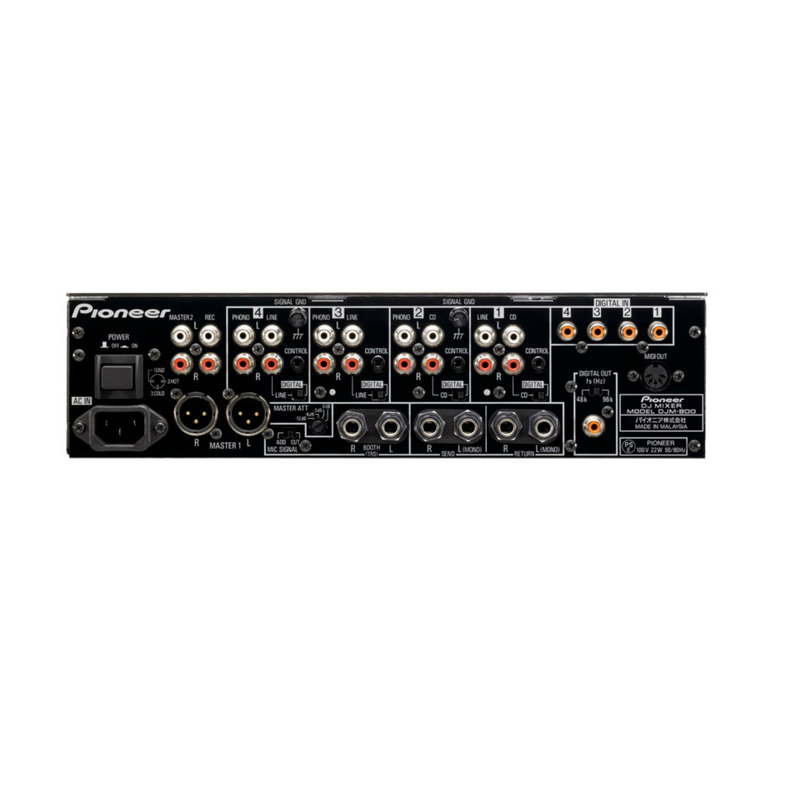 The MIDI signal can be sent from almost all knobs and switches on the surface of the Pioneer DJM800 to external MIDI equipment. 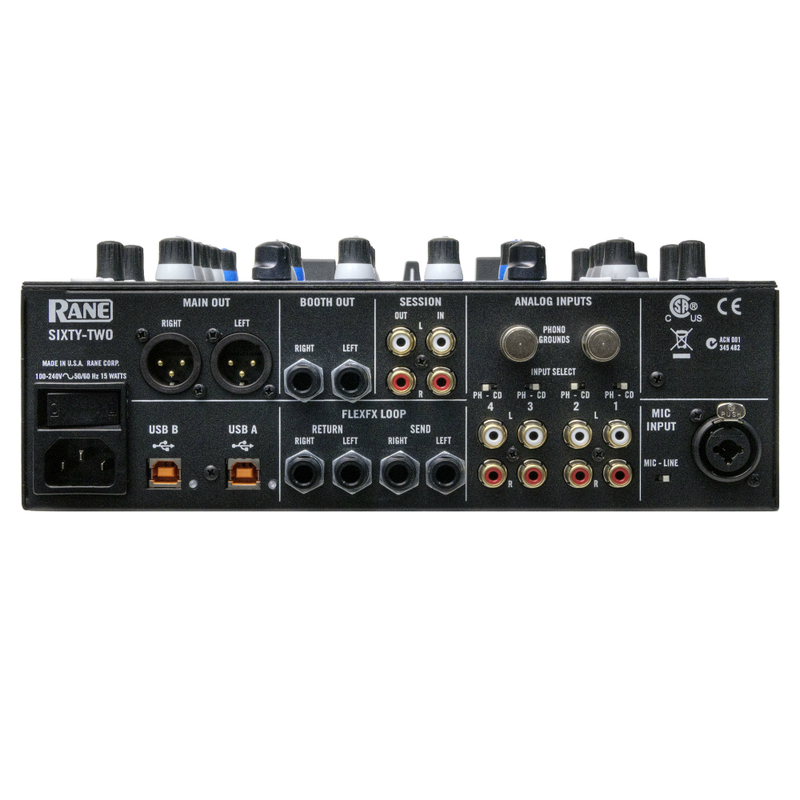 Since this DJ mixer can send out many MIDI signals, it can be used as a flexible interface to music software or hardware such as Ableton Live or EDIROL V-4 Video Mixer.